Numerous individuals over the years have continued to write to the Sustainable Resource Development (SRD) to express their concerns over the annual capture and treatment of the wild horses. This is an example of a typical and recent response from the SRD regarding this year’s capture permits. We would like to outline our responses to the government’s opinions about the wild horses in this letter. Then also give our response to the hunter and the rangeland biologist from the government that were interviewed on Global Television’s 16:9 Wild West program about the horses. The SRD continues to lead the public to believe that the horses are domestic horses turned loose or that have escaped from adjacent ranches. They have failed to research the history of the wild horses in Alberta from the intrusion of the first white man into the west country. If they would put aside their apparent prejudices and do this research, which WHOAS and many notable scientists have done, they would see that the horses have been running free and wild since the first explorers set foot on this land. According to American research, and the documentation of pioneers, the only animals more populated than the buffalo in this country were the wild horses. In 1875 when the NW Mounted Police marched into what is now Alberta, they too documented thousands of wild horses roaming free across the prairies. In fact it is documented in their records, that they abandoned their fancy eastern horses in favour of the wild mustangs who were more hardy and sound. Further research also shows that during WWI the military sent wranglers into the Red Deer River country to round up hundreds of wild horses. These horses were then sent overseas to haul their military equipment and supplies. This is part of the history of what is now our military mounted regiments, for example, Lord Strathcona Horse Regiment. None of these horses ever returned after serving their country. Even native lore shows that these horses have roamed free in this country long before the invasion of the white man. It is also noted on the 16:9 program that the government spokesman indicated there were 1,000 wild horses and that their numbers were expanding rapidly. 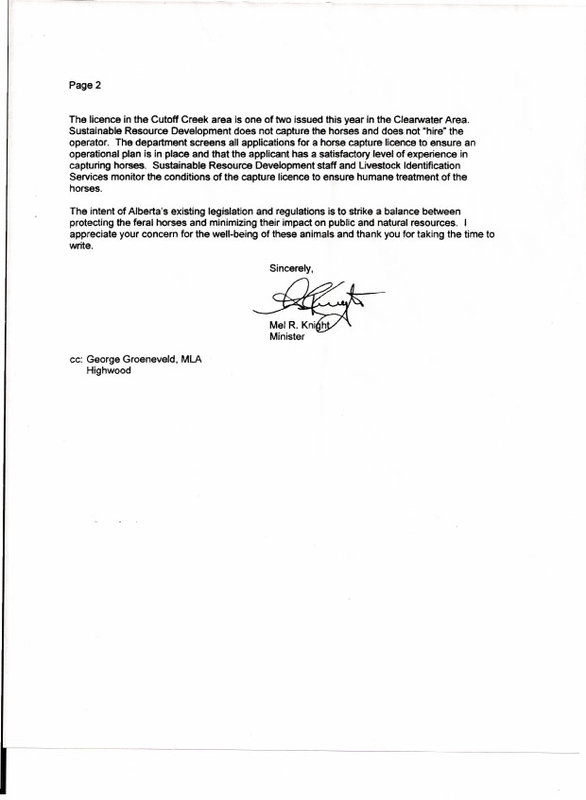 In this letter it states that there is 650 and again expanding. Yet 3-4 years ago they stated that there was only 221 by their aerial count. This indicates a tripling or quadrupling of numbers in just 4 years. Our studies and observations do not substantiate this and neither does science. Natural foal mortality alone takes 20-25% annually. 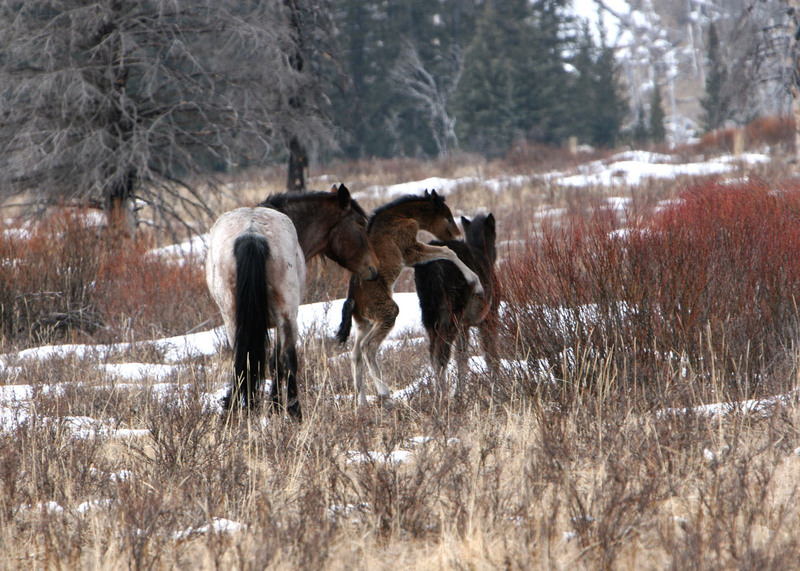 In the worst year, 2005, that we observed, the mortality rate was around 70-75% of the foals. Predators take a large number of horses each year then add the numbers that the SRD allows to be trapped, in a season. The SRD officials further state that the horses cause potential damage to the rangeland competing with native wildlife for habitat. They say that they also take forage away from the approximately 35,000 head of cattle that are allowed onto these grazing leases during their allotted time. It also states in this letter that there is riparian damage and an impact on forest regeneration. Then they go on to say they pose a safety risk if they go too close to roads and highways. All these points are based on preconceived notions on unscientific facts concerning the effect the wild horses do have in their environment. According to government spokespersons in the past, they state that a study was done in 1972 that showed the horses competed against all other ungulates for the same grasses. This study was done by U of Alberta undergraduate Mr. Salter. This is the only study that has ever been conducted and was not done by government, on the effect that the horses may have on the grasses in their natural environment. It never stated that wild horses take away forage from other wildlife. In fact it indicated more that each species, including the horses utilize different species of grasses to sustain themselves. Further extensive research in the United States, show that the horses through their ability to pass grass seeds through their system without damage, actually helps to rejuvenate the natural landscape of their rangeland. On the 16:9 program the government forage employee stated that the horses nip off the grasses to the ground with their teeth. This is partially true. The horses nip off the grass but since they are constantly on the move, they nip at the grass as they go and very seldom stay in an area and take it down to the ground as he stated. Their action allows the grasses to become a healthier plant. Scientific research has proven over and over again this point. Cattle on the other hand, because they can’t do this, will sometimes uproot plants and grasses in order to feed. One only has to travel in wild horse country to see that any damage being done by wild horses is miniscule compared to that being done by logging and oil interests and some outdoor recreation users (ATVs). As far as the point that horses do damage to the banks and creeks is truly false. Those experienced in this country know that cattle with their two toes and with their numbers do far more damage than any other species except for humans. The alleged point that horses impact forest regeneration is again an unscientific biased statement. Studies show that in fact that horses when grazing in areas with new seedlings are actually a benefit. They do this by decreasing the competition by other plant life that are growing along side the seedlings. They also add nutrients through their droppings. In a meeting WHOAS attended, a logging company representative indicated that in their opinion the horses were eating the tops off the pine tree seedlings. When questioned by our vice president as to how he knew this, he stated that there was horse droppings in these areas. Our vice president then asked him whether there were any moose or deer droppings also. And at this point the logging representative did not respond. Studies in eastern Canada by logging companies, indicate that moose do substantial damage to new seedlings. Should the moose be eradicated? The government speculates that the horses may pose public safety risk to vehicles on roadways. In argument, our observations of the wild horses show that they move quickly off roadways when they hear vehicles approaching. Drive down any rural or even the QE II highway and see the number of deer and other animals that are involved in vehicle collisions. The number is astronomical. In the forestry in the summer, while driving at night or during the day, you will always find cattle bedding down or standing on the roadways. Which is more dangerous? Another point we would like to make: There was a hunter interviewed on the 16:9 program who was surrounded by dead animals that he had hunted and killed who stated that all the wild horses should be eliminated. This was due to the fact that in his opinion, the horses were the reason there was no wildlife left to hunt. However, the video clip showed the hunting of deer out in the middle of the Alberta prairies. Our studies show that the wild horses play an integral part in the ecosystems as they exist at the present in what is their natural home range. Even wildlife game species rely on the the horses at certain points of the year for survival. If the horses weren’t a source of prey for larger predators, you can rest assured they would have a bigger impact on the wildlife and maybe even the cattle. If you can’t find horses, you will likely not find other wildlife either. The biggest point in the reduction of the game animals is the extensive logging and destruction of their habitat. These operations do massive damage to native plant species and the environment. Both grizzly bears and elk need vast expanses of undisturbed range in order to survive. Thusly they have left the forestry areas and moved into the private land that borders the forestry areas and parks. In some places this has become a major problem and safety issue for ranchers and other residents in these areas. As far as mule deer go, the intrusion of white tail deer far into the range that used to be exclusively mule deer, has displaced them, due to the fact that the whiletail is the more aggressive in establishing its territory. One other final point relates to the SRD stating that no one was hired to trap the wild horses in Cutoff Creek this winter. However, we have had several individuals tell us otherwise. It is noted that the SRD can suspend the license fee, that is supposed to be collected, as they see fit. We have also found out that unbeknowst to the general public and WHOAS, the Horse Capture Regulations have been changed in several points to allow a more unrestricted capture of the wild horses. 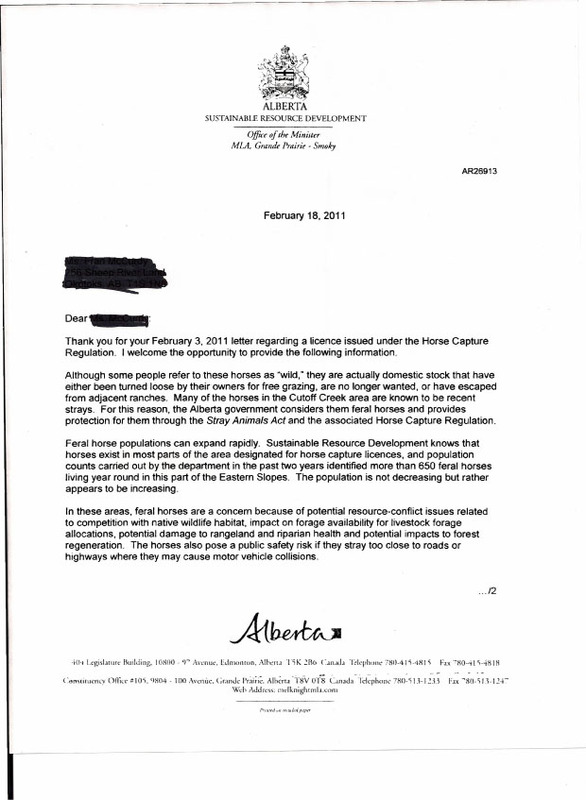 We strongly believe that we had to do this response in order to answer all the biased and unscientific arguments used against the wild horses and their ability to roam free in Alberta. We will continue to work toward having your wild horses protected properly with adequate legislation designed specifically for our wild horses. We continue to thank you for your efforts to support the wild horses.